A tribal dub mix of "JAM ROCK" covered by Dry & Heavy, originally released as Grammy-winning "Welcome to Jamrock" in 2005 by Damian Marley. Featuring roots style dubwise and bongo sessions. 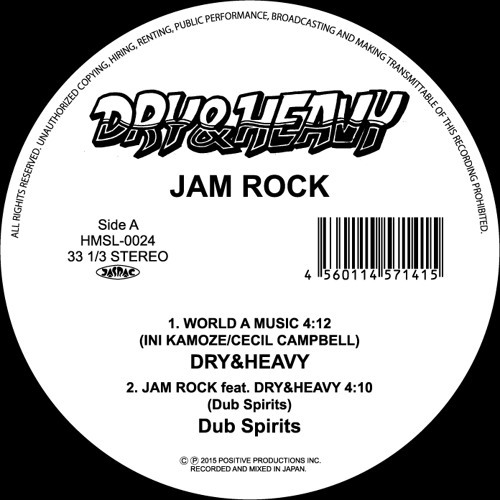 12" and Digital download: http://www.dubspirits.com/jamrock.html Special Award for DRY&HEAVY DUB CONTEST!!! http://ototoy.jp/feature/2015032525 http://www.dubspirits.com/ (c)(p)2015 Dub Spirits Drums & Bass by DRY&HEAVY(SHIGEMOTO"DRY"NANAO & TAKESHI"HEAVY"AKIMOTO) (c)(p)2015 POSITIVE PRODUCTIONS INC.